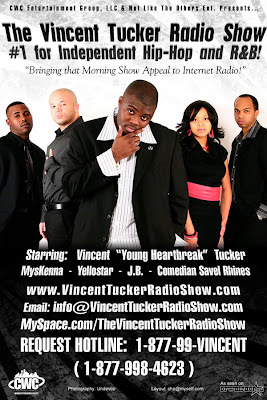 BlackRadioIsBack.com Music: The Vincent Tucker Radio Show (2 for 1) | BlackRadioIsBack.com - Official Blog of the Syndicated FuseBox Radio Broadcast! What's up everyone from the BlackRadioIsBack.com and syndicated FuseBox Radio Broadcast crew! It's time to post up two new episodes of The Vincent Tucker Radio Show for folks to get some good music, talk radio and overall positive vibes for folks. Episode #66 - "Chris Brown vs. Rihanna, Part 2"
After hitting everyone with the Hill Harper feature the previous two weeks, the crew of your Favorite program is in full effect today! Vincent “Young Heartbreak” Tucker, MysKenna, J.B., Comedian Savel Rhines & Yellostar are covering everything today from Mike Tyson in the community, scoring with women, Family Feud and much more! Just as the title states, we’re also creating our own Chris Brown vs. Rihanna battle! Besides debuting “I Can Transform Ya” by Chris Brown feat. Lil’ Wayne & Swizz Beatz plus “Russian Roulette” by Rihanna, we’ll be talking more in-depth about the records plus how both superstars will rebound career-wise from their controversial February 2009 incident. By Popular Demand, Comedian Q re-joins us on the show today! It’s definitely Going Down! Episode #67 - "Heartbreak presents The High-Life!" Vincent “Young Heartbreak” Tucker & CWC Entertainment Group, L.L.C. proudly presents The High-Life, courtesy of The Vincent Tucker Radio Show. Featuring Comedian Savel Rhines & Yellostar, the two take over the proceedings this week along with Comedian Q to entertain with their brash comedy and stance on social issues out there! You’ll Like this one.